Though many strong data teams are building out per-user metrics like engagement score, predicted lifetime value, and favorite product category, few ever put this data to work. Most businesses leave their custom analyses, and more, to rot away in their data warehouses. What if you could use these traits to inform your marketing, for instance, to build different email pathways for engaged and dormant users? And you didn’t want to do the tedious work of downloading and uploading your results to email tools every week? With the new Looker Source, we’re making your insights portable, so you can automatically target complex cohorts in your favorite marketing platforms. 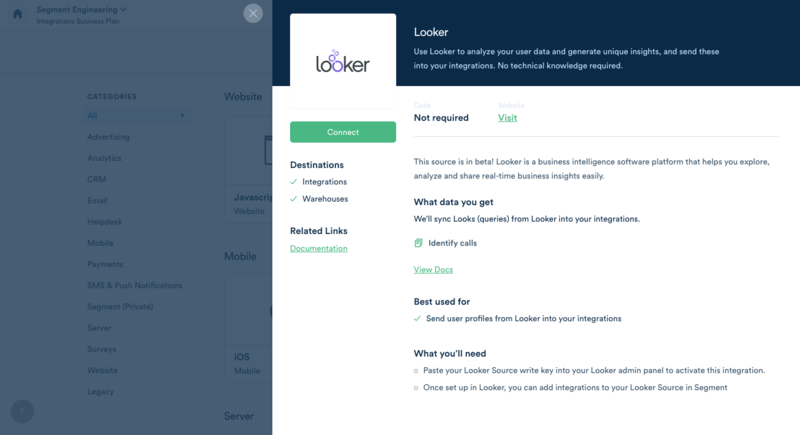 In Looker, a popular business intelligence product, you can develop nuanced audiences and build custom traits based on any parameter in your data warehouse. Then, you can use Segment to tag users with these traits and pipe them to your favorite marketing tools, like Marketo, Appboy, Mailchimp, and more, where you can trigger personalized campaigns. The Looker Source is the first of its kind on the Segment platform, allowing you to build custom audiences to use across your marketing tools. Let’s dive into a use case to walk you through what’s possible with the new Source. It’s near the end of the quarter, and your company really needs that pipeline to close. What could block these deals? Your data has the answer. 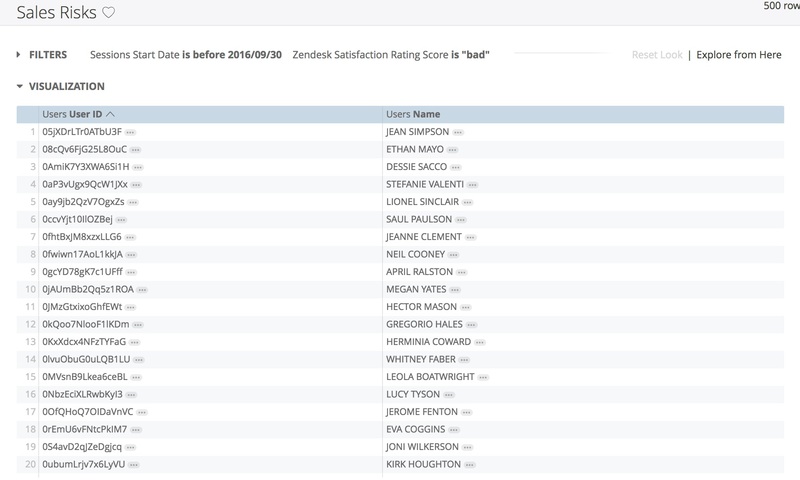 First, you explore Salesforce and Zendesk data in Looker to identify a group of people who are in active deal cycles but have rated their experiences with your product poorly through Zendesk. You create a Look called Sales Risks that includes these users’ IDs. Then you hop into Segment. From our Sources catalog, you choose Looker and add that to your account. Next, you connect your preferred marketing automation tool to the Source, let’s say Marketo, by adding your credentials in the Destinations Catalog. From Looker, you add Segment as an integration and export your Look. 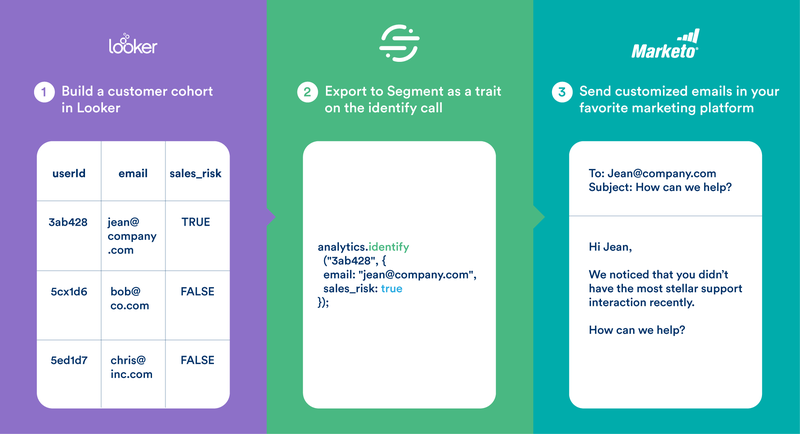 Under the hood, the results pass through Looker’s Integration API, and Segment accepts this information as a trait on the identify call (sales risk = true). We’ll automatically send the users and their traits to Marketo, recomputing on the schedule you chose. Within Marketo, you can set up a campaign to trigger when you see a customer who is a sales risk and try to redeem the account. This is just one of the ways you can use the new Looker Source. For example, you could send ecommerce customers with a high LTV more coupons. You can filter out customers that send you tons of returns from your campaigns. If you already have a marketing automation provider in mind, it’s likely you’ll find them on the Segment platform. Salesforce Marketing Cloud, SailThru, Appboy, and MailChimp are just a few of our server-side integration partners that you can power with customer insights from Looker. To get started, reach out to us if you’re new to Segment or Looker. We’ll help you get set up! If you’re already a customer, jump into the docs and contact your Looker Account Manager today.